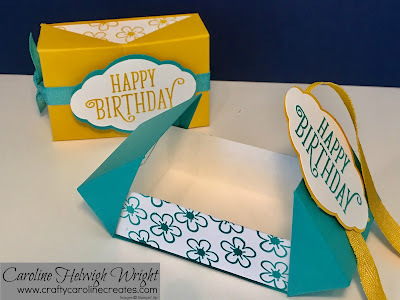 CraftyCarolineCreates: Happy Birthday Gorgeous Double Flap Gift Box - Video Tutorial, New Stampin' Up Catalogue Week. 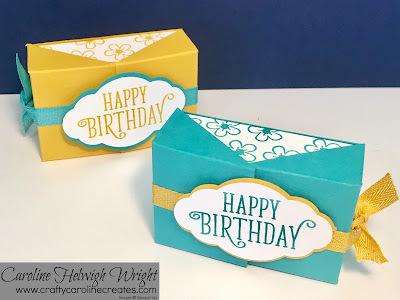 Happy Birthday Gorgeous Double Flap Gift Box - Video Tutorial, New Stampin' Up Catalogue Week. Today's project is inspired by a project from a few years ago, when I made a much larger version of this box. You can see the original project HERE. I have used Bermuda Bay and Crushed Curry together here, don't they pop against each other. The little flowers and the beautiful curly sentiment come from the fabulous Happy Birthday Gorgeous stamp set. This set is so versatile I know I will be using it a lot. The ribbon is new too, mini-chevron ribbon, it is a lovely soft ribbon that ties perfectly. I do still have a spot or two left in my ribbon share, if you would like 1m of 40 brand new ribbons, just click HERE to find out more. Want to see how the box is made? I have a YouTube tutorial for you of course, watch it HERE. Score at 1 inch on all four sides.